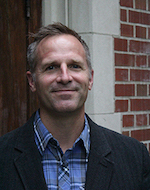 Mark Mulder is associate professor of sociology and director of the urban studies minor at Calvin College, Grand Rapids, Michigan. He is also an adjunct professor in the congregational and ministry studies department. Professor Mulder’s area of research finds focus at the intersection of congregations, race, and the city. His volume on churches and white departure from Chicago is forthcoming from Rutgers University Press. Professor Mulder enjoys engaging in urban life with his wife and four children in the city of Grand Rapids where he has been a neighborhood association president for seven years.